- To pick-up any persons clothing or other inmate property you must obtain a Property Release Form (blue slip) from the on duty custody staff and submit it. If incarcerated inmate is located at Pitchess Detention Center (PDC) you, the visitor, can obtain the Property Release Form from the PDC visiting area at the check in window. 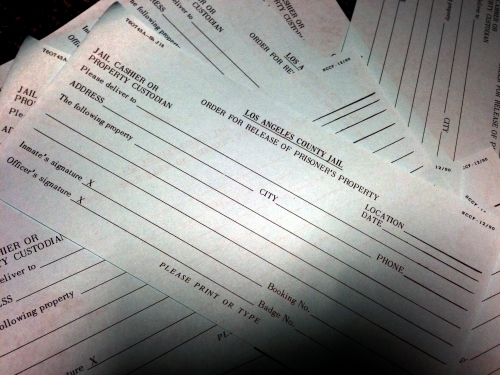 ALL inmate property pick-ups are processed at IRC and are typically processed for available pick-up within 24-28 hours after submission. For more information on any of the above mentioned topics check out our Inmate Information Center webpage at http://app4.lasd.org/iic/ajis_search.cfm or call the Inmate Information Line at (213) 473-6100.